American earth land resources satellite. Earth Observing satellite built by Fairchild for NASA, NOAA, USA. Launched 1982 - 1984. Used the MMS bus. Status: Operational 1982. First Launch: 1982-07-16. Last Launch: 1984-03-01. Number: 2 . Gross mass: 1,940 kg (4,270 lb). Height: 4.30 m (14.10 ft). The Landsat 4 and 5 operational civilian earth resource spacecraft were placed into lower orbits than the previous Landsat spacecraft and carried improved instrument suites. 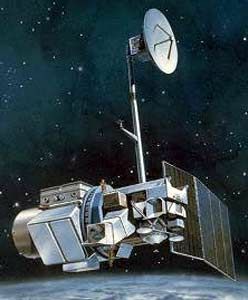 Beginning in 1983, Landsat 4 lost use of half its solar power and began experiencing numerous spacecraft malfunctions which limited spacecraft functionality. This prompted the early launch of Landsat 5 to guarantee continued coverage. Landsat 5 lost two of its primary communications systems (X-Band downlink and a Ku-Band TDRSS transponder) and backup systems were activated. Management of the spacecraft was transferred from NASA to NOAA with Landsat 4. The spacecraft was 3-axis stabilized, zero momentum with control to 0.01 deg using reaction wheels, and had a structure of aluminum with graphite struts. A hydrazine propulsion system was used, and a single solar array with 1-axis articulation produced 1430 W (BOL), Two NiCd batteries provided 100 AHr total. A retractable boom (4 m long) with 2 powered joints supported the articulated high gain antenna which downlinked data via TDRSS. The communications system used S, X, L, and Ku-Bands. 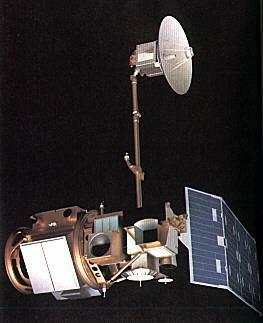 Landsat 4 and 5 carried Multi-Spectral Scanner (MSS) and Thematic Mapper (TM) imaging sensors. TM provided 7 bands of coverage and the MSS had 4 bands. The MSS covered 0.5 to 12.6 � m and provided 80 m resolution with a 185 km swath width. TM covered 0.45 to 12.5 � m with resolution of 30 meters in the VIS/IR bands and 120 m in the thermal/IR bands. Family: Earth, Earth land resource sat, Sun synchronous orbit. Country: USA. Spacecraft: Landsat. Launch Vehicles: Thor, Delta, Delta 3920, Delta 3000. Launch Sites: Vandenberg, Vandenberg SLC2W. Agency: NASA, NOAA, Astro Space, Fairchild. Bibliography: 2, 279, 6, 12755.